More than 700 people have now successfully completed safety training since the Door & Hardware Federation (DHF) first set up its Safety Diploma scheme. This number is set to rise significantly following the expansion of the scheme to cover a wider range of industry sectors. The DHF pioneered the Safety Diploma scheme with the introduction of training for those responsible for the safety of automatically controlled powered gates. 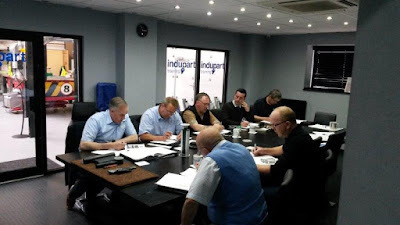 At the start of this year, the training scheme was broadened to provide safety training for personnel employed by industrial door companies and garage door companies. The DHF, which represents the key players in industrial, commercial and garage doors and automated gates, says its Safety Diploma scheme is a key part of its ambitious plan to significantly raise safety standards within the industry. The industrial door Safety Diploma is a two-day course. It is designed for personnel responsible for legal compliance within industrial door companies and ensures they work in full compliance with applicable legislation. It provides delegates with a greater understanding of legislation affecting the supply, installation, testing, inspection, risk assessment, documentation, maintenance and repair of industrial doors. The courses cover all aspects of door safety from initial risk assessment through to testing and commissioning. The start of the year also saw the introduction of the DHF’s Safety Diploma course for garage door company personnel. It covers garage door installation activities including automation of manual garage doors, installation of manual and powered doors supplied by a single manufacturer, and the installation of powered doors where the door and drive comes from different manufacturers. The garage door training course is available to DHF members only. However, the industrial door Safety Diploma course is open to employees of DHF members and non members. The courses are delivered at venues around the UK by the DHF’s own training team. Each successful candidate receives a DHF Safety Diploma certificate. DHF member companies whose personnel attend the training courses can display the DHF Safety Assured logo. For more information on the DHF Safety Diploma scheme, visit www.dhfonline.org.uk/training.aspx .